Aluminum. You know it mainly as the crinkly foil that covers the questionable five-day-old in your fridge or the material that houses your favorite adult beverage. However, for years, it’s also been one of the main metals used when constructing aircraft and supercars. Over the last half-decade though, aluminum has been creeping into the mainstream automotive market. Everything from the Ford F-150 to the Tesla Model S now utilizes steel’s lightweight cousin. What exactly does that mean for the everyday car-buyer? Well, the biggest bonus of having a lighter vehicle can be seen when you hit the pump. Those feathery bodies mean your engine has less work to get your car up to speed which translates into greater fuel efficiency. The downside? Aluminum can be tricky to repair. That’s why it’s important to make yourself knowledgeable before you head to the body shop. 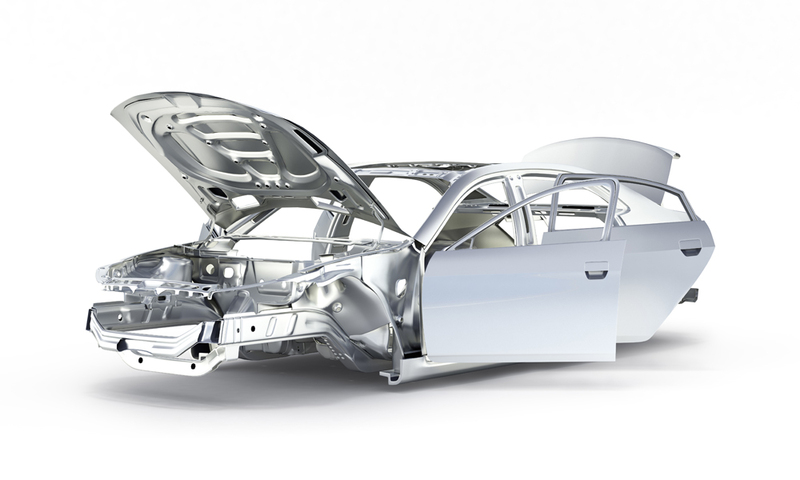 Beyond just the weight, the repair process for aluminum cars is a bit different. Steel has what’s commonly referred to as “metal memory” meaning that it’s more likely to pop back into place with the right amount of pressure, something that aluminum lacks. Additionally, aluminum needs to be heated in order to make it malleable enough to properly work without causing additional damage. Aluminum even requires a different set of tools (though we won’t bore you with the specific names). Since aluminum is still relatively new to the mainstream car market, there are some repair shops that are playing catch up in terms of the technology and techniques necessary to properly fix the dings, dents, and scratches on vehicles that are made of it. In fact, only a fraction of the repair shops in North America are certified to properly repair aluminum vehicles. If you’ve got an aluminum vehicle that needs to be repaired, make sure you ask to see the repair shop’s certification from either the OEM (original equipment manufacturer) or I-CAR (Inter-Industry Conference on Auto Collision Repair). If you don’t see the certification hanging somewhere in the store, walk away. It doesn’t matter how good the deal is, if you want the job done right you need to head somewhere with qualified technicians. Even though repairing an aluminum car is a little (okay, a lot) different than repairing a steel vehicle, that doesn’t mean there should be a huge difference in price. If you’re using quality, trained technicians – like the ones at Inter-Tech Collision Center – then the price for your repair should be at or close to what you could pay for a repair on a comparable steel vehicle. If you’ve got any additional questions about aluminum repairs or are looking to set up a repair for your own vehicle call Inter-Tech Collision Center today! Visit “Locations” to find the Inter-Tech closest to you.